I’ve been wanting to make an investment in some Kickstarter program for a while. A friend of mine got involved in the early pre-alpha stage, but I couldn’t find a project that I got that passionate about until now. I love Kiva and the idea behind it, but the idea behind something that could radically change social networks is pretty sweet too. These guys could easily steal my percentage of the $70K that they raised and go buy beer too, which is cool too and I’m happy to support them for having the chutzpah for doing that. I’ve never really been able to get behind Facebook. I post all of my updates via Twitter and respond to email from about 4 people on it. I find it a bit mundane in terms of what is being shared and I, no offense, only have a few friends that add interest and value to my life. The rest is just kind of nice to see. I like these people, but I don’t need the updates about their lunches and they don’t need mine. Frankly, if I lost 90% of my friends (who aren’t really friends but mostly distant acquaintances), I wouldn’t lose a lot of sleep over it. Throw on all of the headache behind the privacy stuff and I start to think about dropping the whole program. I don’t know if I’ll go so far as to completely pull the plug on FB, but I find myself, in my old age, caring less and less about what other people happen to like nor do I feel so compelled to share what I like. Odds are, you don’t like what I like. Jason’s post really swayed me this morning. Not so much to quit FB, which I think is coming for me, but to also start exploring other alternatives. 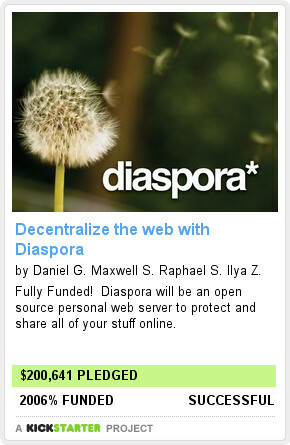 In the words of Archers of Loaf, the underground is over crowded.Diaspora was getting a lot of traction today. I loved the video and really like what these guys are trying to do. I think that old people are going to have a tough time getting it, but if you think about bitorrent for social networks, that sums the premise up nicely. It is obviously still a long ways away from going primetime and having grandma hit you up for a friend request, but I don’t think that it is as far away as others are saying. $70K buys a lot of coding time from 4-talented devs living on raman and Coke. If I can launch an open source version of FB for free in 15-minutes (terrible video), these guys can do it in 3-months.Of course, the Diaspora video also seems like this is the kind of scam that was concocted over large amounts of cheap beer and bad coffee, so who knows.UPDATE – TechCrunch, of course, has a another post on Diaspora. At the end of the year, I read Michael Fertik’s great post, 2010: The Year of Atomic Branding on my friend Jennifer Leggio’s blog. I file this under ‘scary – interesting’ and I thought that was the end of it. A couple of weeks later, I’m in the city for the weekend with my family. We had just trudged through the rain and were sitting in the bar of the St. Francis. The kids having hot chocolate, me having a martini and I checked in on Foursquare. The act of checking in on Foursquare when I’m with my family delights my kids because they like to know the Mayor of places. The act of checking in on Foursquare pisses my wife off to no end and has been the cause of many a shopping spree. Flashback to Michael Fertik’s article, the potential threat of oversharing on social networks. Of course this got me thinking about how safe location based social networks are. How vulnerable are we? I’ve heard interesting stories about people & stalkers and being dumped or being fired because of FourSquare. I haven’t heard about people being robbed. Yet. A week or so later, I did a simple check to see how vulnerable we really are. I did a quick search for people in San Francisco sharing their status on Twitter and checked in on FourSquare or Gowalla. It’s a simple query using Twitter’s advanced search capability. What I found amazed me. People checked in all over the place. FourSquare was living up to it’s reputation. However, an easy cross check from Twitter – where people tend to put their full name and where they live, with WhitePages.com let me easily figure out where people lived. I don’t mean just the city, but also their exact address and even a nice little Google Map with directions to get there. Of course, not everyone is easy to find on WhitePages.com, but my quick little informal experiment yielded about a 25% hit rate. I got freaked out. No more FourSquare for me. In the old days, burglars would prowl around neighborhoods looking for empty houses. Today, they simply need to search for affluent neighborhoods and look for people who have checked in at places more than a few hours away. The movie theater for example. I took it one step further. Here is a feed for people who have checked in or are posting “I’m at” the key phrase for both Gowalla and FourSquare. When people say where they are, they also say where they aren’t (home, for example). Glad I have an alarm system. How long until someone really malicious does a nice little Twitter / WhitePages mash-up? Great video on the value of social networking.YouTube – Social Media ROI: Socialnomics. View more presentations from schnaars. day 13 – you should know….Originally uploaded by .lisakimberly. 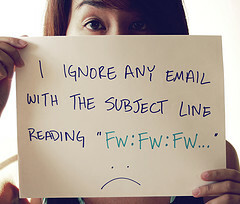 Are you sick of being copied on email threads where you really shouldn’t be? You know, ’cause FYI or people want to keep you ‘In the Loop’?Do you spend too much time searching for that old email about that old project for that new employee?Do you get more than 50 emails a day? Are most of them occupational SPAM?If you answered yes to any of these questions, you need to put email in it’s place.Come see me speak at Santa Clara University with Terri Griffith and learn about how email got to this point and how Enterprise Social Software can help to reduce the glut. I’ve been really excited about this latest announcement from my company, Socialtext. 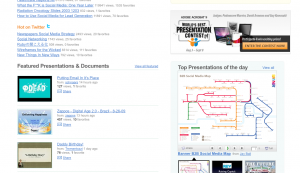 So many organizations are looking for a micro-blogging platform, but don’t want a.) it hosted in the cloud or b.) a full collaborative suite.As a customer of mine said recently, micro-blogging is the gateway drug to social networking. Today it is 140 characters, tomorrow it is blog postings and wiki edits.SocialText. A) All of the following 10 aspects have one common objective:Create a better customer experience for your clients that allows you to compete in a smarter way with a much higher degree of effectiveness.B) The “Social Media Question” is not whether you or your company is ready.It is whether you or your company can catch up with your customers who are already there. Today, prospective customers (like all of us) search the Internet, read blogs, forums & group discussions, ask questions in their social networks, join on-line communities, and, in the end, know very well what they want, where to buy, and how much to pay. The more significant the purchase, the more completely the customer educates himself. All in all a social media savvy sales person has 3 major advantages over the one who care less:1) They know much more in much less time about the same customer than their competitor2) Even more important, that same customers knows so much more about the sales person and where and how to reach them, that the competition has a hard time to even have a conversation.3) A positive relationship between buyer and seller has begun, even before any direct contact or face-to-face meetingThe rest of the paper is excellent. I’ve said it before and I’ll say it again. Convince your boss to let you use this stuff. It will make you a better sales person.